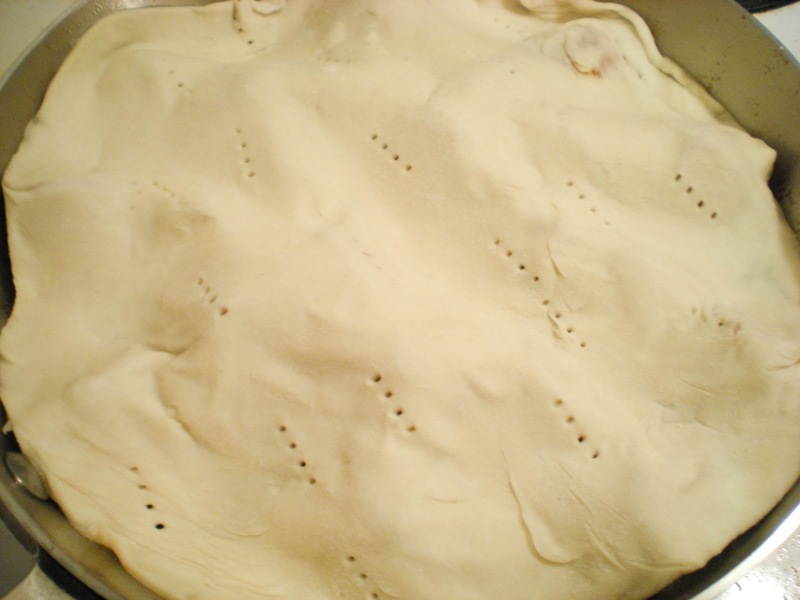 Have you made your pie for Pi day on March, 14th? If you're a nerd like me, Pi is a mathematical constant which its value is approximately equal to 3.14... so that's why last Monday, we celebrate Pi day, the day we grab a slice of pie. Last year, I didn't make a pie, instead I blog about the new Australian Pie place (Tourtière Australienne), which is opened in Montreal for more than a year now. Check out their selection of hand-size pies from my last year post. This year, I decided to go for a challenging dessert. 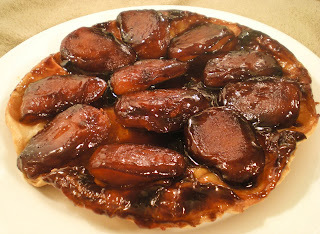 Since French cuisine is one of my specialty, I went for the classic Tarte Tatin, an upside-down caramelized fruit tart. This is a very technical and difficult to get it right for an amateur baker, even trickier if you never caramelize sugar. I have to confess that I burnt the sugar twice before I got the caramelization at the right consistency. 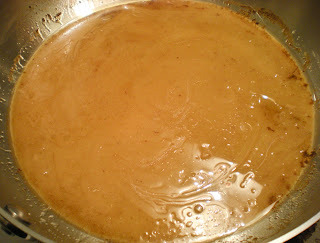 I did have a hard time to remove the burnt caramel from the skillet, so be prepared to clean the skillet, if you end up burning the sugar. The key to a perfect Tarte Tatin is getting the puff pastry dry and flaky, the fruits juicy, soft and well caramelized with a hint of acidity. If you meet all these criterias, you should be proud of yourself! 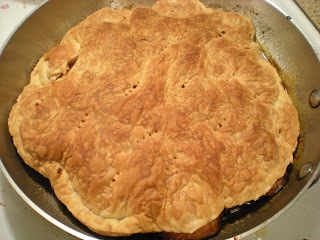 My Tarte Tatin was nearly perfect, only a few wedges of apples stuck onto the pan when I flipped the tart to the plate. Apart from that, the tart tasted just like I describe it. If you're brave enough to take on this dessert, let me know how it turns out. 2. Peel apples, cut into quarters and remove cores. Toss it in a bowl with 2 tbsp sugar and lemon juice. 3. Roll puff pastry dough into 11'' x 11'' on a lightly floured surface. 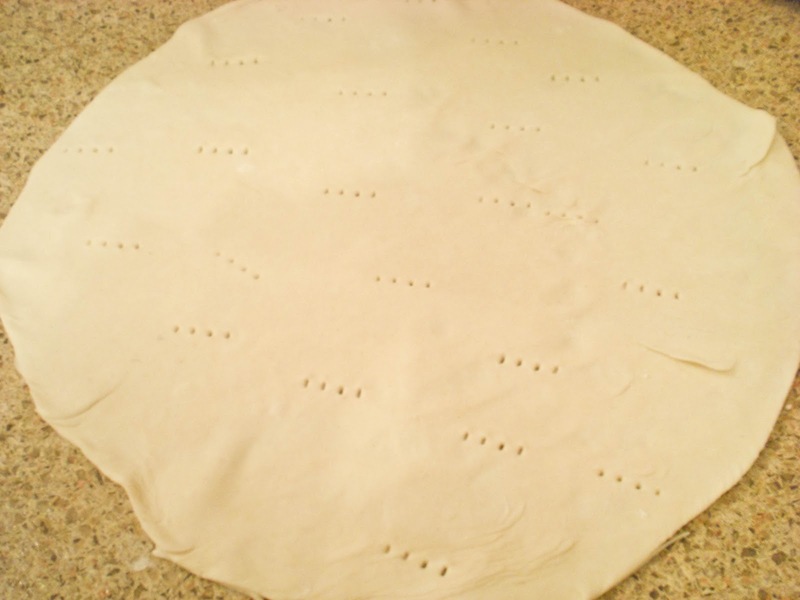 Cut pastry into a circle about 11 inches in diameter, using a 9-inch skillet as a guide. Prick pastry with fork. 4. In a 9-inch oven-proof skillet, melt butter over medium-high heat. 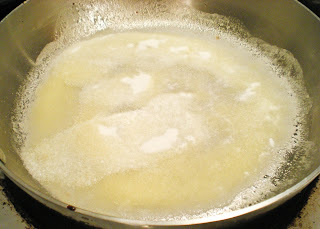 Cover it with sugar and cook until it starts to foam and mixture is light brown, about 2-3 mins. Keep a close eye on the sugar! 5. 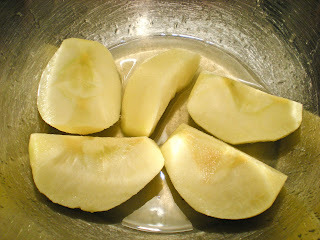 Remove skillet from heat, arrange apples around the edge of the skillet, flat side down. Fill the middle with the remaining apples. 6. Turn heat to medium-low, cook apples for 6 mins. Shake pan occasionally. Turn apples during the cooking process, about 2 mins per side. End turning with apples rounded-side down. The caramel should be bubbly and darkly colored. 7. Remove from heat. Lay pastry dough on top of the apples, tuck in the edges so that it fits into the skillet. 8. Transfer skillet to oven. Bake for 25 mins or until the crust is golden brown. 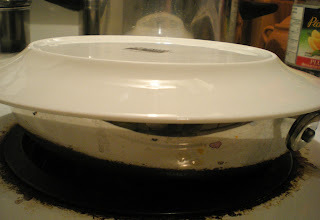 Rotate pan halfway. 9. Remove from oven and cool in the skillet for 15 mins. 10. Now the fun part. Place a serving plate on top of the skillet and hold it tightly against the skillet. Flip skillet and plate and set plate on the counter. Carefully lift the skillet up, leaving the tart behind. 11. Serve with your favorite ice cream or crème fraîche. this is just gorgeous, what a fun spin on apple pie! Sounds good to me. Now I know what pi day is. A beautiful pie for pi day. Nicely done. this sounded really not easy to make especially the sugar cooking part.. i think i enjoy this by just admiring it first. also thanks on the poached egg method, that's easy and helpful! the first egg i did was not so nice, not the technique but rather the egg itself. The moment i break the egg, the yolk just got mixed up with the whites so it didnt turn out as nice as the other one. Your tart tatin looks mouthwatering. Crispy and caramelized! That is such a delicious treat! Your tatin looks droolworthy. Omg, wat an inviting and irresistible tarte tatin...feel like having a slice.. Delicious tarte tarin with apples. caramelized apples gives more flavors. What a scrumptious tarte tatin! I wish I had a piece for dessert! Looks amazing! Tarte tatin was one of the first things I ever baked, and for some reason I haven't made it since. But this one looks amazing, so beautifully caramelized! Oh my, I am still drooling. Looks amazingly delicious. Happy Pi day! Even if it's a couple of days late...haha :) My favourite 'nerdy day' is mole day :D The first time I caramelised sugar, I burnt it too :( The recipe I was cooking off didn't tell me that the caramel could get burnt :( I've always wanted to make a tarte tatin- it sounds really interesting and delicious :) Yours looks so yummy! I've wanted to make this classic for so long! Thank you for the reminder. Your version looks perfect! Bon appetit! Very beautiful Victor and a perfect choice. Tres French too. Victor, I love apple tarte and your looks so beautiful! Your take on pie looks amazing! We also celebrate pi day, but this year I only had it in me to buy a couple of frozen ones and throw them in the oven. It's amazing what ice cream can make taste good. It's Thursday and we have a new recipe up on www.twelvemakesadozen.blogspot.com. Your recipes make mine look like child's play, but maybe you will like these...fresh Apricot Jam and Apricot Chicken. The easiest recipe on the planet and I know at least a dozen kids who love it! Leave me another comment and let me know what you think. So happy to hear someone else celebrated pi day besides us. I didn't cook,ut we made sure we had apple pie for dessert at lunch and for supper we had Pizza Pie. I must say your tarte tatin looks to die for! I love caramelized fruits and this looks great, will have to try it! I had to come back and check out this recipe again; I am saving it to make when I return to my kitchen. you really make it sound like I could make this. Thanks for your interest in the Tarte Tatin. 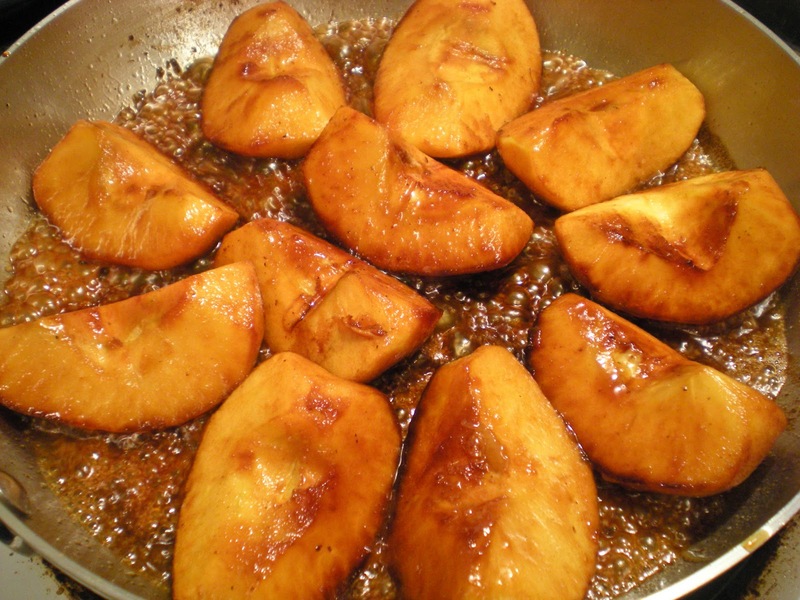 Make sure not to burn the caramel (always keep an eye on it) and remove skillet from heat when placing the apples. Good luck, let me know how it turns out. I love apple pies! Caramelized apples have made this apple pie to a perfection. Apple pie is one of my favourites! I really like caramelized apples, your tart really look yummy! Hmm? Never heard of Pi Day. By the way, lovely pie you've had. Tart tatin is one of my favorite desserts! Victor, I love the large chunky apples in your Tarte Tatin. The caramelized is the best part. So delicious. Thanks for the step-by-step photo direction, as well. Your Tarte Tatin turned out so beautiful! Lovely step-by-step but what I really like is the final product. Wow! Very impressive! I actually had not heard of Pi today before this year! Such a classic dish, this looks fantastic!